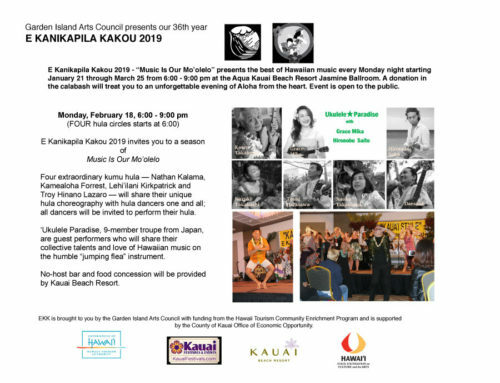 A week after the final night of EKK 2019 and I’m getting comments of “music withdrawal” from among the many who meet every Monday night to enjoy the best of Hawaiian music at the Kaua’i Beach Resort Jasmine Ballroom. The annual mahalo breakfast gathering following the last night of EKK is a chance for the loyal team of EKK volunteers to share their most memorable moments of the season. What they share is a microcosm of what the many audience members experience. The responses run the entire gamut of performances – from the impact of the live performance of the amazing Amy Hanaiali’i Gilliom whose magical voice stuns everyone lucky enough to be present, to the sweet sounds of Jeff Au Hoy’s steel guitars that help everyone to experience nostalgic flashbacks to the earlier days of Hawaiian music, to the charismatic performance of John Mahi whether he is singing to three hotel guests in the lobby or the 400-plus packed into the ballroom, to the breath-of-fresh-air-performance by Kaua’i rising star violinist Kimberly Hope — but many were in agreement that the finale night with the magical sounds of the Makaha Sons was a hands down great way to end a remarkable season. 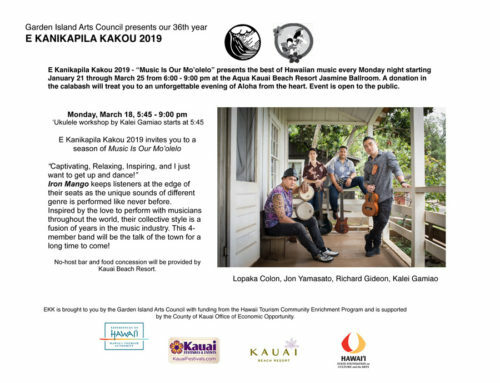 A stellar performance by a stellar group is what met the near overflow crowd at KBR as the Makaha Sons presented their music at the final evening at EKK 2019. Their drawing power is still as strong as ever and everybody who is anybody was there. From the minute they stepped on stage until the last echos of their guitars rang out, theMakaha Sons sound was reaching every person in the Jasmine Ballroom. What was it? Was it the power and strength of their collective voices? Was it the selection of crowd-pleaser songs? Was it their diligent sound guy Hanalei working from the back of the room to see that every song was delivered with the same power and harmony? Was it the excited audience happy to be sitting or standing in the packed ballroom? I don’t know, but whatever “juju magic” those gentlemen used, it was definitely and unmistakably there. Their music is full, rich, powerful and uniquely their own . . . a sound that reaches out and grabs all the existing ether in the room and delivers their songs right to your na’auaowhere the full impact of the music make your spirits soar. The added bonus of hula after hula bringing so much color and excitement to the stage left the audience breathless. In 1976, 33 years ago, a small band emerged out of the Nanakuli/Waianae neighborhoods; they were called the Makaha Sons of Niihau. “I was 21 years old in 1976,” says Jerome. 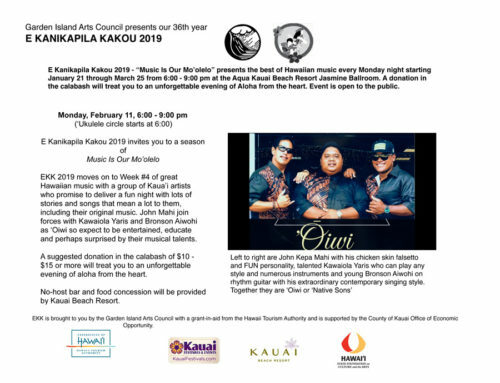 Their stories were brief and mostly chronicled the evolution of the group from the early days of Bruddah IZ and Skippy Kamakawiwo’ole of the original Makaha Sons of Niihau to the long tenure of the band with Moon Kaukahi and the Brothers Koko – Jerome and John. Today, Jerome join forces with the fantastic talent of Kimo Artis, who was one of Palani Vaughan’s “King’s Own” and veteran entertainer Mark Yim whose parents, Lehua and Kama Yim, were early EKK loyals when they lived on Kaua’i. An interesting note is that Kama Yim and Bill Kaiwa were hanai sons to George Waterhouse of Kipu Kai behind Mount Ha’upu, a unique gathering place that attracted early musical icons. Much of their musical heritage stems from this familial relationship with Uncle George. Jerome Koko did right by the Garden Island Arts Council to ask for the final night performance because they wrapped up a fantastic year of “new, old and forever music” in one of the most unforgettable performances seen on the EKK stage. They just have it and they flaunted it big time. Lady Ipo Kahaunaele-Ferreira served as emcee for the evening and kept the show moving at a fast pace from the big EKK welcome, to playing the giveaway Kamoa ‘Ukulele, to singing the Doxology, to introducing the artists. I was also surprised when an unexpected bouquet of long-stem red roses from the EKK team were presented to me. “Whee- haw!” Ipo also did a bang-up job as the ‘ukulele circle teacher, giving the ‘ukulele players a complete package of learning a song from the chant version to singing the mele to playing the ‘ukulele and wrapping it all up in their own mini-concert, all in 45 minutes. The show began and the Makaha Sons burst into song; their harmony hit you like a ton of bricks. The audience response was resounding applause as they sang two songs in theirMakaha Sons repertoire and three of Uncle Dennis Kamakahi’s most popular songs —Pua Hone, Wahine ‘Ilikea and Koke’e. Stunning hula dancers Elena Gillespie and Po’ai Galindo were the embodiment of Wahine ‘Ilikea, and eight keiki hula dancers from Leilani Rivera Low’s halau brought so much excitement to the stage swishing their green ti leaf skirts toKoke’e. Jerome acknowledged Uncle Dennis as a composer who was way ahead of our time; his musical legacy lives on with all the musicians who follow. With soaring voices they sounded like a chorus of violins singing Ku’u Pua Tuberose. Mark Yim talked about Hank’s Place, a popular place in Kaimuki that his grandparent frequented, back in 1978. They harmonized on Hali’ilua, one of the Makaha Sons songs from these very early days. They followed this with their favorite Olomana song composed and recorded by Jerry Santos in 1974. Mark Yim was the vocal lead on Ku’u Home O Kahalu’u, a song that made a significant impact on the music of Hawai’i at that time and continues to be a favorite to this day. They then called on Kumu Hula Leilani Rivera Low and Halau Hula ‘O Leilani with whom they have been performing for 22 years in Reno; they will be going in a couple of weeks to the Atlantis Casino to be part of her annual Reno concert. Leilani sang Nani Kaua’i in her extraordinary voice while ten of her hula dancers, dressed in simple but stunning lavender hula dresses, graced the stage with their dancing. Lady Ipo announced a surprise for Grandpa Jerome Koko. Sabra Kauka, who teaches Hawaiian studies at Island School, introduced five of her Halau Na Pua O Ka Mailedancers. They danced the hula to Ka Loku, a falsetto number sung by Kimo. One of the dancers was none other than Jesslyn Koko, Jerome’s granddaughter who lives on Kaua’i. He was very touched by this surprise. Jerome sang a beautiful song made popular by Peter Moon and the Cazimero Brother asSunday Manoa; crowd-pleaser Vern Kauanui filled the stage with his very graceful hula. They followed this with a medley of fast Hawaiian songs and one of Frank Kawaikapu’okalani Hewett’s hula songs. Following the intermission, the ‘ukulele donated by Kamoa ‘Ukulele was won by Larry Fitz of Michigan. Six lucky persons also won CD’s by some of our outstanding musical groups. Starting the second set, Jerome sent out special thank you to Aunty Carol and ‘Ohana, especially to Masami and Jill Kouchi who provided special Kaua’i hospitality by bringing them beautifully packed bento lunches upon their arrival and prepared them a special Hawaiian dinner to take with them on the airplane as they had to leave right after the concert. Mark Yim talked about their love for all kinds of out-of-the-box music and did a quick check of music that the audience loved. They were in sync. Special among them is the “plethora” of music left by Glen Campbell when he died in 2017. They sang a medley of country and western songs including Gentle On My Mind by Glen Campbell. They sure knew what buttons to press to please the audience. Besides their singing, they demonstrated so much humor in their stage banter. With their collective years of performing, their showmanship is at the top. They decided to have the audience participate in the next song with the whole ballroom divided in three. Stage right followed Kimo singing one long note, stage left followed Mark singing a higher note; the center audience followed Jerome with the lowest note. All this was in preparation for the singing of White Sandy Beach, one of the most significant songs in the Makaha Sonsrepertoire. None of the groups quite got their notes right, but everyone was game and happy to join in. Leilani dressed in her white holoku came up to dance the hula to White Sandy Beach. It was mesmerizing. 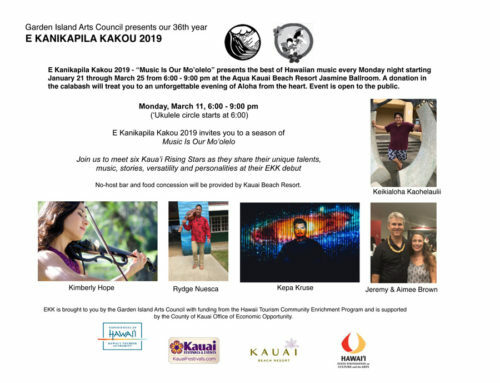 This was followed by the very special song Ke Alaula by Bill Kaiwa and Moon Kaukahi about the cycle of life and the importance of living life to the fullest; the soaring music is definitely one of the most recognizable songs of the Makaha Sons. Leilani’s dancers filled up the stage with their graceful choreography; Leilani joined the halau as she emerged front and center among her dancers. 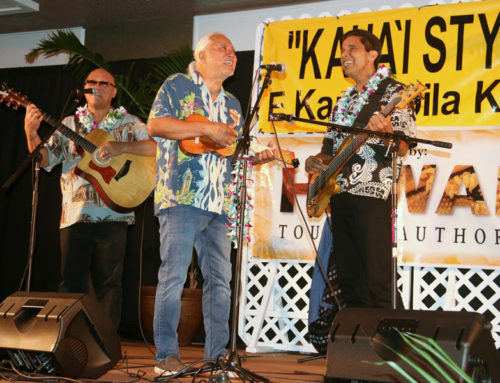 Kamalani, composed by Larry Rivera with his daughter Leilani as the namesake of the song, was recorded by the Makaha Sons. It’s a beautiful soaring melody which brought hula dancers Vern Kauanui and Lady Ipo up to the stage. It’s hard for hula dancers to pass up the opportunity to dance to the singing of the Makaha Sons. As if the music was not enough yet another huge and breathtaking surprise was Leilani’s dancers decked out Tahitian style in their coconut shell bra, waving headpieces, feather waistbands over ti-leaf hula skirts and the Tahitian mating calls dancing to Ua Mehameha. It was so colorful, so feisty, so exciting . . . so entertaining. The youngest hula dancer solo’ed a superfast Tahitian shake ‘n bake hip action and the crowd showed their appreciation with huge applause. Wow! We could have been at Reno because we got no less than a Polynesian revue. They went right into a hula medley that brought kumu hula Leilani, dressed in electric blue holoku, dancing out to join her dancers . . . it was like being at one of Leilani’s hula reviews. Ending with Waterfall was brilliant. Fabulous! It was a show to stop all shows and a great way to say goodbye to EKK 2019. Mahalo to all those who sent emails, letters, text messages, scribbled notes telling us how much you appreciated EKK. We love that you love it!